I see you there, trying not to let past experiences define you. Courageously trying to keep your heart open to love and trust and the fragile bond of friendship. But I also see your fear. And I understand your fear. I know you’ve been hurt many times in the past. I know you’ll be hurt again. Just as you know you’ll be hurt again. And it’s hard to hold onto hope when your hopes have been crushed. It’s difficult to take a chance on someone or something that may hurt you. So you accept those feelings of loneliness rather than overcome the roadblocks in your mind. But worse than simply accepting them, you justify them. You tell yourself that you are strong—that you can stand alone—but we both know that you’re bitter and jaded. And afraid. So very afraid… Of trying again. Of failing again. Of risking rejection for the thousandth time. Because you’re not strong. And deep down inside you hold onto the belief that one more heartbreak could kill you. You are more than your fears. More than your failures. More than the clutter that litters your past. You are strong enough… to break down these barriers. To overcome the insecurities that have confined you for so long. You have what it takes… to trust again. To hope again. To love again. You deserve freedom in its most wondrous form. Today is the day to embrace it. And to live—fully live—free of fear. Rebekah, this is just what I needed today! The Lord used it to really help me. So glad it spoke to you. Keep moving beyond your fears! Glad you were encouraged and uplifted. It’s always nice to know that I’m not merely writing for myself (though this post was most definitely written to me). 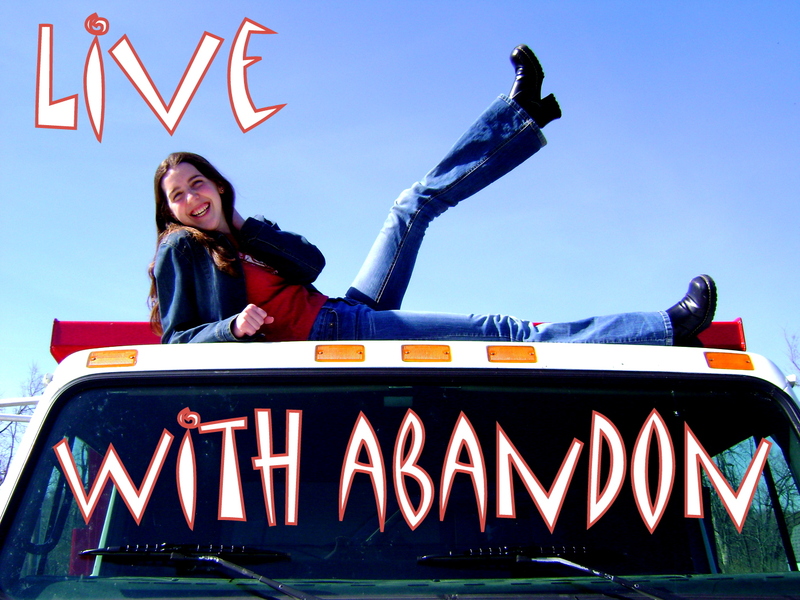 Live with abandon! I’ve just realized, by reading the comment below, that I had read over the first paragraph without noticing that the topic of this post was love and falling in love again. To me “your deserve more than your fear” applies on a wider range of experiences – practically on every situation which evokes fear of failure or rejection. Actually, this little love letter was about friendships for me. About letting new people into my life after the old ones failed. But you’re right. It could be about anything, really. So please, read it however you wish. You got the part about risking rejection again being out of the question right. I don’t see myself ever taking that chance. Love may be grand, but (right now) it is absolutely not worth the risk of the crush which (every time up to now) ALWAYS follows it. I accept and embrace the lonliness so that I can work on the road-blocks in my mind, not to preserve them. Right now, I see little progress – and doubt any “real” results from that work – but work at it I do. And in that respect, accepting lonliness is justifiable… I’d be a poor partner for anyone as I am. That’s not to say that sometime down the road I may feel strong enough to risk it again…. but if it hapens again it will be down the road; far, far beyond the horizon – as seen from a 747 at cruising altitude. “Love is always worth it,” my mother said, stroking my hair as I sobbed on her shoulder. And I knew even then as my heart cracked open that she was absolutely right. Loving him was worth it. Still is. Not to say that I didn’t wonder what it would have been like if he had never come into my life. Or if I would have known how the story would end and decided not to love him, after all. But in the end, I always want to say it was worth it. No matter the pain. No matter the heartache. That’s what I’m talking about when I say that you deserve more than fear. You deserve those relationships that will strengthen you and better you and challenge you and, yes, even hurt you some days. And you deserve to know that it was always worth it. Having loved and been loved. We were not made to live life alone. I hope you’ll find the kind of people who will come crashing through your hesitations and invite you into a life that is so much more than you ever dreamed it could be.